Increased the socket count from 12 and 16, to 18 and 26. Also adds 4 new mutations. - Finally tidied up the mutation connectors fully. - Fixed a Bug with mutated Metabolism where toxicity reduction would not be accurate. - Changed the values for Razor Blade. Added a means for users to easily uninstall the mod. Popup Notification for first time installs. 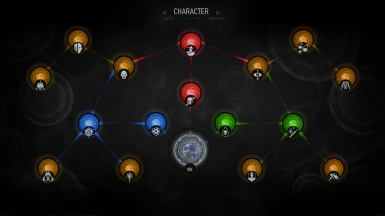 Added customisable skill tree unlock values in the config file. Mutated Metabolism now also increases the charges for decoctions by 1. Fixed a bug where reloading a save would cause toxicity to double. Added a config file for settings. 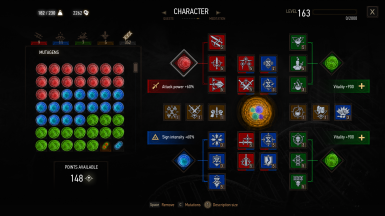 Extra Skill Slots and Mutations. 6 new sockets for the base game and blood and wine panel. 4 new sockets for the blood and wine mutations panel. This version does not add new mutations and only adds new skill sockets. This version adds both Mutations and Skill Sockets. The number of charges for Decoctions in increased by 1. Decoction toxins are now treated as potion toxins. Whilst in Combat toxicity falls 0.75 points per second faster, and again for each adrenaline point, (Up to a maximum of 3). You can hold your breath indefinitely underwater. The range of the Yrden Glyphs and Trap is increased by 20% and stay active 10 seconds longer. Foes within Glyphs or struck by the Trap have a 25% chance of igniting, (Value depends on Yrden intensity). During Combat melee blows charge your Sword by 3% (or 6% with the correct Blade Oil) which increases sword attack power by the total value. The charge on your sword declines overtime. If it exceeds 60% Armor is ignored and if it exceeds 95% the next attack instantly kills, and will reset the charge. Weapon and Armor degradation is reduced by 100%. Coming in a future update. This was mainly done so that you won't need to worry about merging with other smaller mods. Standard Levelling - You can either unlock all ability slots from the beginning, or use the vanilla system of unlocking slots as you level up. 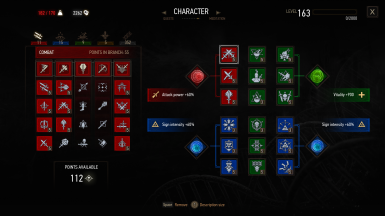 NGP Leveling - Same as standard, but applies only to NGP, you can choose to have all ability slots unlocked, (vanilla) or lock them until the required level is reached. Those levels will be based on your NGP starting level. Disable BaW Socket Colors - The bonus slots granted by BaW can only accept skills of the same color, you can disable this feature. Mutation Socket Levelling - You can disable the levelling system for the BaW sockets, as long as you have a mutation equipped all bonus sockets will be unlocked. Potion of Restoration can Restore Mutagens - You can decide if the Potion of Restoration will return mutagens spent developing mutations. Thanks to rfuzzo for letting me use his work. 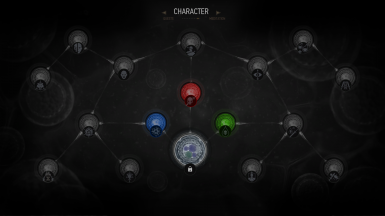 Set Skill Tree Unlock Values - Decide how may points you have to invest in a skill tree to unlock each layer, for all 3 tabs. Disable Skill Confirmation Popup - You can disable to confirmation popup box whenever you upgrade or buy a skill. rfuzzo for letting me use his Restoration Potion Fix Mod. 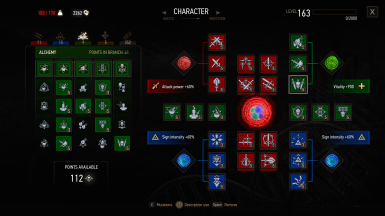 If you would like to add your own Blood and Wine style mutations check out my Custom Mutations Framework.